Basking in reflected glory here, because some of my former comrades from the site at Whitehall Roman Villa have made a wonderful find: the skeleton of a man who died in about the 5th century, and the remains of the shield that was buried with him. There’s video footage and some pics from the local paper here. 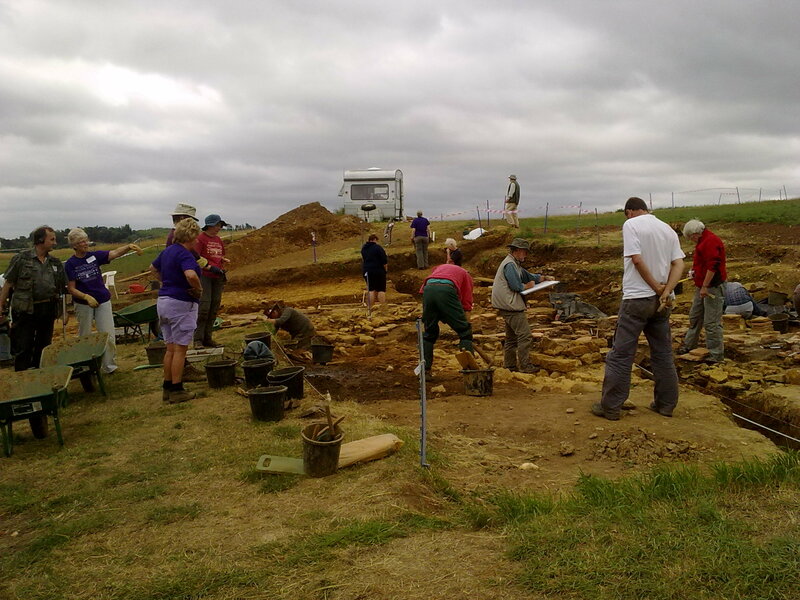 I was privileged to be part of the Whitehall Villa team for over a decade and it was an education: not only about archaeology, but about how volunteers and a supportive landowner can work together to make something fantastic happen. Happy memories: some of the volunteers working on Bath House Two. Others standing around and offering helpful suggestions. I find it amazing that you had time to raise boys, write great novels and be an amateur archeologist. Now, my next question is when do your readers get another measure of Ruso and Tilla? Have to admit it all went past in a bit of blur, Jamie! The second draft of Ruso and Tilla’s latest adventure (VITA BREVIS) went back to the editor on Friday, and with luck it won’t need too much more tweaking for publication in the spring. Hope the next outing for Nick Grant is coming along well? Hurray for Vita Brevis! I was wanting to know that myself. I so much enjoy these books! Your excitement over a skeleton brought a smile to my face. The Whitehall villa does sound like a wonderful project. Yes I have to admit that finding a skeleton wouldn’t be everyone’s dream day out! But I do miss the Whitehall team (and you guys too).